In his book, To Change the World, James Hunter persuasively argues that the religious right and the religious left are nothing more than mirror images of each other. The civil religion of the religious right should be obvious to everyone paying even superficial attention to religion and politics in America, but as Hunter points out, the religious left has a civil religion that is basically the same in character as Christians on the other side of the political aisle, and both groups are centered on a faulty hermeneutic. Hunter defines civil religion as "a diffuse amalgamation of religious values that is synthesized with the civic creeds of the nation; in which the life and mission of the church is conflated with the life and mission of the country. American values are, in substance, biblical prophetic values; American identity is, thus, vaguely Christian identity" (145). 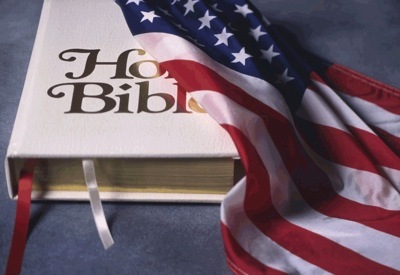 The religious right has used Scripture for years to commend to the state what its positions on domestic and foreign policy should be. Romans 1 and the Old Testament Book of Leviticus are employed to oppose gay marriage. 2 Corinthians 9:7 is quoted to oppose government taxation for social programs, and 2 Chronicles 7:14 is used as the rallying cry for a national revival. "If my people, who are called by my name will humble themselves and pray"..., is interpreted as referring to the people of America. The problem, however, is that God is speaking to his people of Israel. No modern nation can rightfully claim to be the people of God. The Bible reserves the language of divine peoplehood for two "nations" alone-- Israel and the Church. Thus, when Christians interpret that verse in reference to the United States, they misinterpret it. If 2 Chronicles 7:14 is to be a rallying cry for revival, it should be directed at the people of God, the Ecclesia. Jim Wallis, among other politically progressive Christians, has rightly complained that the Christian Right is engaged in promoting "civil religion" rather than in biblical Christianity.... Yet Wallis and others in the Evangelical Left engage in the identical practice for which they criticize the Christian Right (145). Wallis even quotes Isaiah in defense of an increase in the minimum wage (147). The problem, of course, is that Amos, Micah, Isaiah, and the other prophets were living in a Jewish theocratic setting. The only way that Wallis and others can make these strong statements is to confuse America with Israel and the political dynamics of modern American democracy with the divine laws mandated for ancient Israel. It isn't that the wisdom of scripture is irrelevant for the formation of political values, but one can only make the close associations and specific political judgments Wallis does by turning progressive religion into a civil religion of the Left.... Both Right and Left, then, aspire to a righteous empire. Thus, when he [Wallis] accuses Falwell and Robertson of being "theocrats who desire their religious agenda to be enforced through the power of the state" he has established the criteria by which he and other politically progressive Christians are judged the same (147). If the religious right and the left want to get the target of their hermeneutic correct, they need to understand that the commands of Scripture are directed toward the people of God Israel and, from the Christian standpoint, the church. It is the church that is to embody the prophets' concern for justice and the Torah's concern for morality and purity. And it is by that biblically based way of life that the church engages in the politics of witness that it is God and not the nations who rules the world. The church by its example bears witness to the nations what God wants of them as well. Once the nation becomes the primary hermeneutical target of Scripture, the primary community of faith becomes the state. The church is eclipsed in this world and so is the kingdom of God. And once the state becomes the primary community of faith because the Scriptures are applied primarily to the state, civil religion is at hand. The church no longer plays the role of prophet to the nation; it becomes a puppet of the state. Both the religious right and the religious left have their own brand of civil religion based on the same modern Liberal and individualistic assumptions. The religious right freely admits this. It is time for the religious left to stop denying it and own up to the truth that they have the same agenda, though their issues are different. Additional reflections on this subject can be found in my book, The Politics of Witness: The Character of the Church in the World. Good point. I'd appreciate more details on what this means to call the church to apply God's ethics rather than the state. Shouldn't we be urging the state to do what is right to the extent we can? But it does make sense to say when we perceive an injustice to ask "What is, what can the church do?" before asking "What can the government do?" Of course, we should let the powers-that-be know when an injustice is being committed. Tertullian said to the empire, "You'd be a better empire if your didn't kill your children" (a reference to the practices of abortion and infanticide). But the church's first task is t be the kind of people who do not kill their children and thereby give witness to the state in their life together.